James Cartlidge, MP with supporters of The Soper Collection. 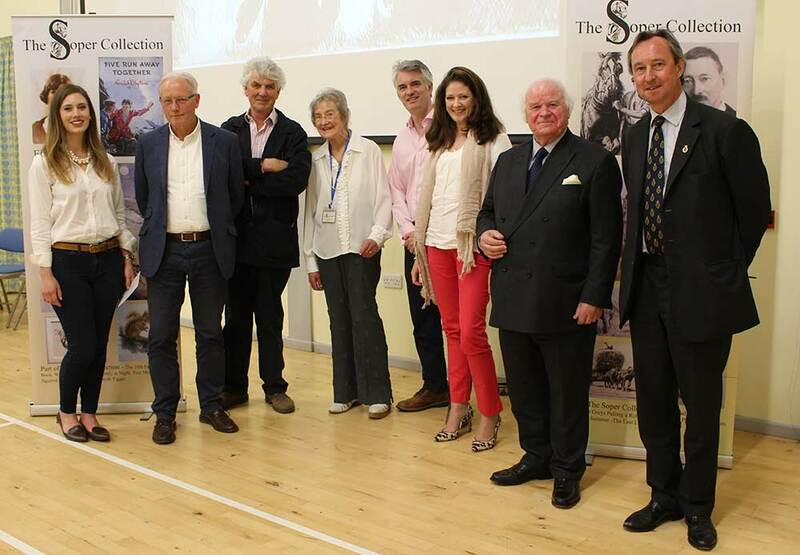 Photo left to right: Julie Melinda-Stehling, Ralph Carpenter, Paul Heiney, Joy Baker, James Cartlidge, MP, Emily Cartlidge, Nicholas Pearson OBE, George Vestey, High Sheriff of Suffolk. Ambitious plans endorsed by the High Sheriff of Suffolk, George Vestey, and backed by Paul Heiney, to celebrate an exquisite family art collection dedicated to rural life and the working horse have been unveiled. The Soper Collection comprises more than 700 works of art by George Soper and his younger daughter Eileen as well as porcelain by his elder daughter Eva. Eileen was a famous illustrator for Enid Blyton, including all of the Famous Five books, while Eva’s porcelain designs achieved strong recognition. A fundraising appeal has now been launched to open up the collection to a wider audience through a purpose-built education centre and art gallery celebrating the family’s love of rural life and wildlife. The Soper Collection was the brainchild of local resident Joy Baker’s late husband, John, who became captivated by the work of the family 25 years ago. A charity company has since been formed to drive the project with land identified near Lavenham in Suffolk. Speaking on behalf of the Soper Collection, Joy said: “This is an exquisite collection that should be enjoyed by a wider audience. But there is also a huge educational attraction which is equally important. “I quickly fell in love with the work of the family – the luminosity and the sheer grace and power of the work. The exciting plans have received the backing of television and radio personality, Paul Heiney, an advocate for the preservation of working horses. Mr Heiney, who worked Suffolk Punch and other heavy horses on his farm in Saxmundham for ten years in the 1990s, said he is thrilled to be supporting the plan and sees it as a celebration of working horses as well as the work of the Soper family. Mr Heiney explained: “When I heard about the plans to house these amazing works of one family in a gallery and education centre and create, among other things, a celebration of the working horse, I was always going to support it. “I think the working horse is underappreciated, especially in rural counties like Suffolk. We should celebrate the culture of the working horse and I am delighted that this is going to keep that alive.